Here's a round-up of all the biggest news from Star Wars Celebration 2019. For years, Star Wars Celebration has been a huge event for fans of the Star Wars franchise. It's a tradition that began back in 1999, when George Lucas used it to promote Star Wars: The Phantom Menace, and while it sometimes skips a year - there was no Star Wars Celebration 2018, for example - this one's a special one. It marks the beginning of the marketing campaign for the last film in the sequel trilogy - Star Wars: The Rise of Skywalker. Over the weekend, there'll be a whole host of panels focusing on everything from the movies to the comics, from the TV shows to the Galaxy's Edge theme park, from the computer games to the novels. Lucasfilm hold a lot of news in reserve ahead of Star Wars Celebration, which means there's a lot for Star Wars lovers to keep up with. Attention has naturally been focused on the films and TV series, and it's not hard to miss some of the other key announcements. The sequel trilogy will come to an end with Star Wars: The Rise of Skywalker. At the Star Wars Episode IX panel, Lucasfilm president Kathleen Kennedy and director J.J. Abrams stressed that they have a responsibility to bring a satisfying close to not just the sequels - but the entire Star Wars saga. The title is every bit as mysterious and enigmatic as that of Star Wars: The Last Jedi, and it's sure to inspire a lot of speculation over the months to come. Is this referring to the last of the Skywalker bloodline, Kylo Ren or Leia? Does it refer to a major role for the Force Ghosts of Luke and possibly even Anakin? It probably doesn't mean Rey is being retconned as a Skywalker, but it could mean Rey moves beyond Jedi, founding a new order called "Skywalkers." The Star Wars 9 panel ended with the much-anticipated release of the first trailer for Star Wars: The Rise of Skywalker. It was only a teaser trailer, raising as many questions as it gave answers, and it began with an extended scene in which Kylo Ren chases Rey down in his TIE Interceptor. Inspired by Alfred Hitchcock's Cropduster scene in North by Northwest, this ended with Rey performing a stunning Force Leap over Kylo Ren's fighter with her lightsaber in hand. The trailer ended with the Resistance heroes unexpectedly heading to what appeared to be Endor, and looking out at the wreckage of the second Death Star. As the screen faded to black, there was a sinister and very familiar laugh. When the lights came back on after the trailer, the delighted audience found that Ian McDiarmid had taken to the stage. 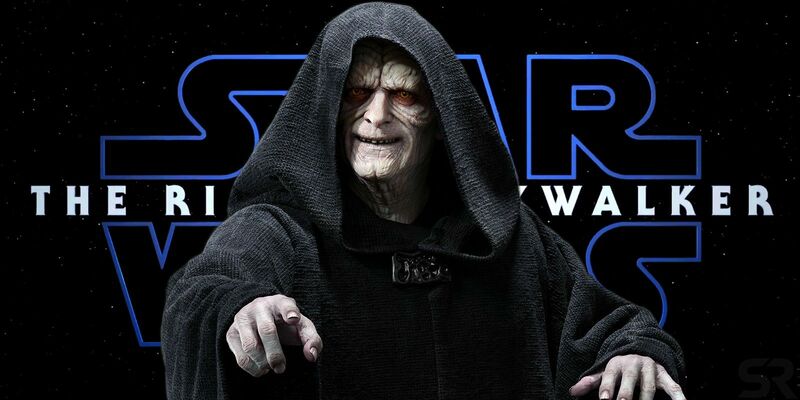 His presence confirmed the shocking twist: Palpatine is back. The panel carefully avoided answering any specific questions; they wouldn't even indicate how much time had passed between Star Wars: The Last Jedi and Star Wars: The Rise of Skywalker. Still, Naomi Ackie did confirm that her mysterious character's name is Jannah, and Lucasfilm revealed that Artoo has a new droid friend, D-0.